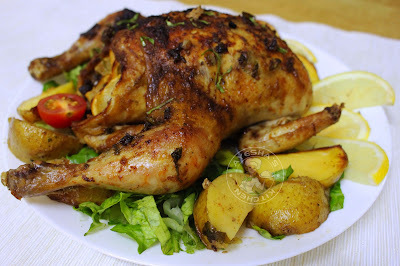 If I am asked to pick one comfort food for myself, I would go for this roast chicken recipe / whole chicken recipe with the most amazing flavor ever. The flavor combination of lemon, herb and butter is absolutely a delicious combo. This lemony, garlicky and buttery whole chicken recipe is an addictive chicken recipe for a dinner meal. It is very true that the herbs parsley leaves and coriander leaves add a refreshing flavor when adding to savory dishes especially when added to chicken dishes. Chicken with lemon recipes is my favorite as it has a refreshing flavor and taste. I do love adding lemon juice to most of my chicken recipes. 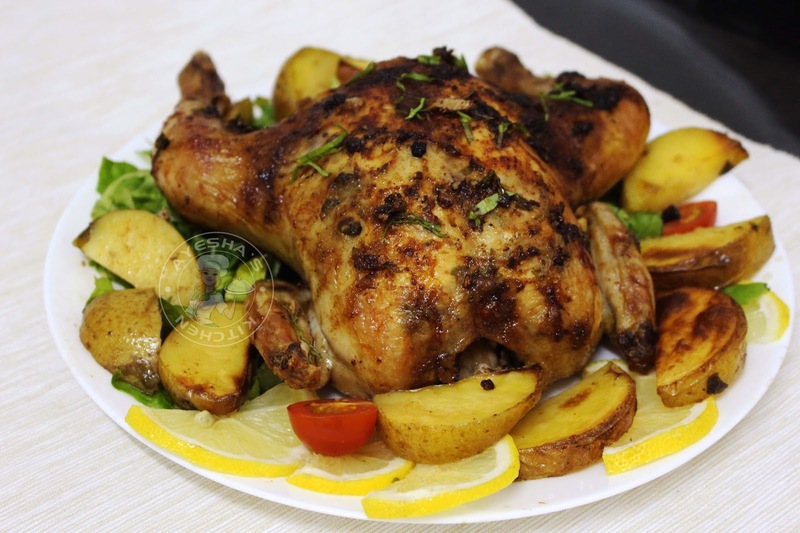 Do try this easy to prepare, healthy and the best lemon chicken recipe for this weekend dinner and enjoy the bursting fresh flavors of this roasted chicken with your loved ones. This recipe is inspired from a wonderful cooking blog yummy tummy (Aarthi) and I made my own alterations in the chicken marination to suit my taste. Thank u Aarthi for this yummy recipe. Let's move on to the recipe. Here i used hands to spread the garlic butter mixture liberally over the entire chicken. Even, I spread some under the skin by separating the skin gently from the top of the breast. This helps to flavor the meat better and be careful not to tear the skin. A simple recipe but sounds delicious, right? Hope you all love this garlic lemon pepper chicken combo. Here is the recipe showing how to make lemon garlic chicken / baked lemon chicken recipe /lemon roasted chicken /garlic lemon chicken /lemon chicken recipe /oven baked chicken. Now mix the softened butter with all the ingredients given under chicken marination. Make a thick buttery paste. Set aside. Pat the chicken dry. Poke holes in the chicken with a knife. This makes the marination to penetrate inside. Rub half of the prepared marinade under the skin of the chicken and the remaining over the chicken. Marinate well. No need of coating with a thick paste over the chicken as it will get burnt quickly while roasting. Spread some garlic butter inside the cavity of the chicken and stuff it with quartered onion and lemon. Now grease a pan with some butter or oil. Place the marinated chicken over it. Place the potato slices around the chicken. Roast for 40 minutes or until the chicken or until the chicken is firm and becomes golden. Remove the chicken from oven after 20 minutes and take the juices from the pan and pour it over the chicken and potato slices. Again pop it into oven and roast for another 20 minutes (that is, the total time taken is 40 minutes). Serve along with butter nan, Hummus, and simple vegetable salad.